Four people died on the evening of April 26, 2014 when a vehicle driven the wrong direction on Texas highway 287 slammed head-on into a vehicle carrying four passengers. 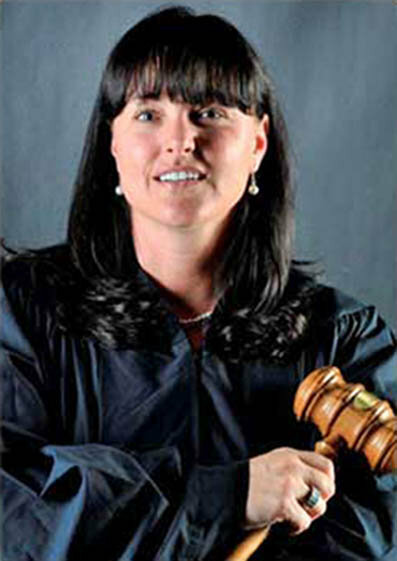 No one knows why Terri Johnson, forty year-old Wise County Justice of the Peace, was driving the wrong way, although alcohol has been ruled out as an explanation. Authorities were slow to release the names of the three other persons killed in the head-on collision and they have been largely overlooked in the reporting of the story. They weren’t responsible for the accident, and they didn’t hold prominent positions in the community, so all the attention descended on Ms. Johnson. Last Saturday, my wife Nancy and I drove three and a half hours to Quanah, Texas to attend the joint funeral of the three semi-anonymous victims of this unspeakable tragedy: Juan Rios, 32, of Quanah, his wife, Amy Culwell, and Juan’s mother, Terry Rios, 50, also of Quanah. Nancy and I were in attendance because Amy is Nancy’s cousin, the daughter of Craig Culwell of Tulia, Nancy’s step-uncle. I had never met Juan, Amy or Sherry, and sometimes felt like a bit of an impostor. But the 800 people who jammed First Baptist Church of Quanah knew these people and hard grief was etched in every face we met. The sanctuary might have held 500 people sitting shoulder to shoulder, with 300 more pressed along the walls and foyer. There must have been 100 floral bouquets arrayed across the front of the sanctuary. There was something remarkable about the entire experience, and four days later I’m still trying to figure out what it was. I suspect the families had a hard time finding clergy willing to preside at the funeral. Juan and his mother Terry were both Roman Catholic while Amy belonged to the Church of Christ. This isn’t the gay-marriage-blessing United Church of Christ we’re talking about here; this is the southern Church of Christ, the staunchly conservative wing of the Restoration Movement that refuses to worship or “fellowship” with Baptists. Catholics are right out. As a result, the two officiants were a Catholic deacon who serves three North Texas parishes (the shortage of priests grows more acute each year) and a Baptist from a small church in a small town I had never heard of. Unlike most of their clerical colleagues, these men were willing to give solace to a deeply traumatized community even if it meant stretching the rules a bit. If your theology doesn’t let you respond to deep grief, you need a new theology. Both officiants bent over backwards to be inclusive and welcoming. “We come from different backgrounds and denominations,” the Catholic deacon declared, “but we all follow Jesus and we all want to get to heaven.” When he asked how many of us were Christians every hand shot into the air. Well, maybe not every hand. He didn’t ask if there were any atheists or agnostics in the crowd, or if some preferred the “spiritual but not religious” label. That’s not a thing in Quanah, Texas. Like Quanah Parker, the people of North Texas are socially adaptable, and it was on display during the worship service. I couldn’t get over the diversity of the congregation–it looked exactly like the demographic breakdown of the surrounding community. Most of the mourners were white, but many were Latino and the African American community was surprisingly well represented. I doubt very much that anyone has made a concerted effort at racial reconciliation in Quanah, Texas. That sort of thing would be frowned upon. But the three people who died in a tragic car wreck were well known in the community. Juan was a trucker and his Anglo wife, Amy, worked for years as a hair dresser. Both had attended high school in the same general vicinity and, a dozen years after graduation, encountered their old school friends on a regular basis. The Sunday morning worship hour may be the most segregated hour in America; but when the school bell rings on Monday morning, we are about as integrated as we ever get, especially in small Texas towns where private schools aren’t an option and there’s just one school. I have no way of knowing how many of the 800 people crowded into the sanctuary were regular church attenders. If the music was anything to go by, not many. I am used to officiating at funerals where the family has no church connection, but back in the day folks seemed to know a hymn or two, or they just let me pick the music. At the funeral in Quanah, the family picked the music, sometimes with eyebrow-raising results. It could be argued that Country music, largely because it deals with the ordinary stuff of life, offers its own brand of spirituality. Take Luke Bryan’s recent hit, And Drink a Beer. Bryan calls the song “a memorial” because it was inspired by the untimely deaths of two family members. When that last line came over the PA system (there was no live music at all) all the church folk did a double take. Did the singer just say what we think he said? Luke Bryan didn’t head down to the local church and visit with his pastor when the bad news arrived–he walked to the edge of a pier and drank a beer. There aren’t many piers in dry North Texas, but I suspect most of the folks on hand for this funeral deal with their grief by picking up a cold one. Other than Kris Kristofferson’s One Day at a Time, Sweet Jesus, none of the songs were particularly religious. The recessional was Mariah Carey’s take on the old Harry Nillson song I Can’t Live, if Living is Without You. It’s a brilliant pop song, but there’s nothing remotely hopeful about it. But then we are talking about the deaths of three innocent people who by all rights ought to be alive, so the lyrics fit the occasion to perfection. I can’t live, I can’t give anymore. A lot of people in the room felt precisely that way. In fact, the lyrics of the songs that were played evoked deep sobs and emotional gasps throughout the room, so I guess they did their job. The pastors said all the expected things about the dearly departed being in a better place, walking with Jesus, being reunited with family members, and all the rest, but it didn’t fit the occasion and the preachers appeared to know it. They also gave the mourners permission to be mad at God and assured us that God was big enough to take it. (Thirty years ago, such sentiments would have been almost unthinkable.) I suspect the country songs communicated because they didn’t try to say too much. In the face of senseless tragedy, there isn’t much to say. When the church no longer central plays a central role, people find alternative communities of consolation. The folks who raised their hands when asked if they were Christians were sincere. Of course they were Christians. They are Texans, for God’s sake, and being a Christian is just part of the mix even if you rarely get up in time for worship on Sunday morning. But you didn’t sense that religion was the primary glue holding this group together. There must have been 60 people, most of them women, wearing Dallas Cowboy uniforms. In the bulletin, Terry Ann Rios was pictured in a Cowboy jersey–I guess she was a big fan. So were her friends. Watching the ‘Boys while grilling burgers and drinking beer is a big deal in small Texas towns, so showing up to a funeral in Cowboy blue and white makes a certain kind of sense. It evoked kinship and a sense of shared identity. 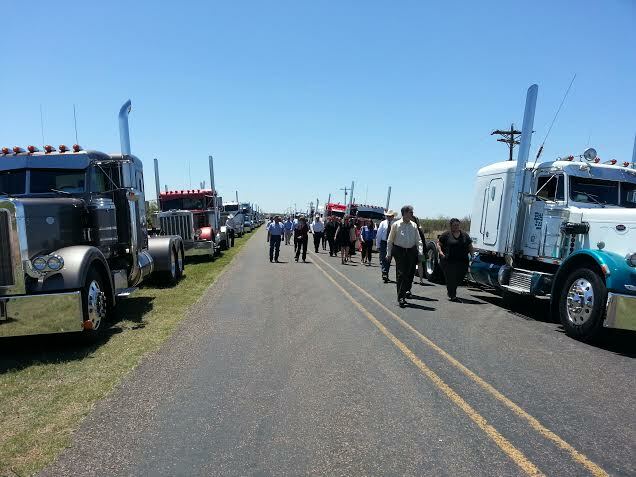 In similar fashion, the trucker friends of the fallen Juan Rios made a point of driving their Kenworth and Peterbilt trucks to the church and they led the processional to the interment service ten miles to the north. It was 45 degrees F when Nancy and I got up that Saturday morning, but it was 95 when we arrived at the country cemetery shortly after noon. We must have walked half a mile to the graveside service, passing at least forty trucks parked in long rows along the way. The truckers formed a close-knit fraternity, an alternative church of sorts. They wanted to make a statement, and they made it. North Texas is changing. The churches, once the heart and soul of every Texas community, are gradually losing their influence, especially among the beer-drinking crowd who watch the Cowboys on television, holler for the local high school team Friday nights, listen to country music, and rarely make it to church. This slice of Texas rarely votes, they don’t know anybody who’s anybody, they are over-represented in the state’s jails and prisons, they work hard at demanding and often demeaning jobs, and when they die the papers and the TV crew from Fort Worth pay little attention. So they cobble together an alternate culture in places where no one is looking, using bits and pieces of whatever lies close at hand and hanging onto one another for dear life. As three balloons were released into the air a cheer rose from the crowd. Then we made our way back to our vehicles. 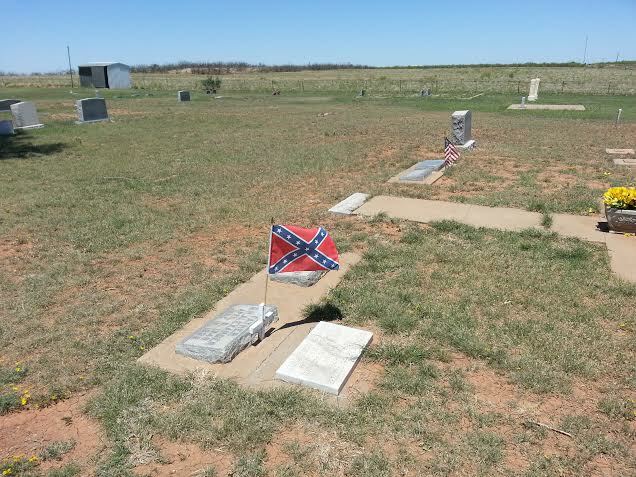 I couldn’t help noticing the confederate flag flapping beside one of the headstones, a sinister reflection of the old Texas. Somebody felt they were honoring the memory of a loved one by planting a symbol of hatred and division by their grave. Maybe they thought the deceased would derive some consolation from the stars and bars. I wondered how these Old South holdouts, the quick and the dead, would feel about the racially diverse group of mourners filing out of the cemetery. Texas might not be changing in ways conservatives or liberals might desire, but in its own ornery way, Texas is changing in hopeful ways few of us comprehend . A funeral in Quanah, Texas gave me a glimpse into one emerging slice of the new Texas, and there’s a lot there to like. None of the three deceased nor their families were any part of First Baptist Quanah. Yet that church opened its doors in hospitality. After the services in the church and the graveside rites, some 200-300 family and friends returned to the church for lunch. After I had my fill of fried chicken, various potato dishes, salads, deserts and iced tea (there was no pier and no beer) I made my way to express gratitude to the ladies of the church for the sumptuous meal. I made it a point to acknowledge that neither of the families were part of First Baptist Quanah. One of the ladies responded, “No, but they were part of our town.” That’s Jesusism 101. May their tribe increase. Wonderful description of culture in a small town of North Texas where tragedy exposes it. Quanah, TX has had several tragedies in 2014 already. Anyone would be surprised at all the friendly people in the community. You speak so highly of this service and it is appreciated. When we go to a funeral we expect to see ONE coffin, we never expect to see the front of the church lined with coffins. THREE beautiful lives lost and one little angel left to pick up the pieces. Keep this family in your heart and say a daily prayer for each of them. Small town folks often provide the warmest welcomes and are usually the hardest to forget. The service was absolutely beautiful. If everyone was to come together like this (of course not under these circumstances) the world would be a much better place. Im glad someone saw what many were seeing this whole time. Yes, Mrs. Johnson lost her life as well (said a prayer for her family as well) but this poor Quanah family appeared to be JUST people instead of someone’s loved ones. They were each equal regardless of where it happened or the title they held. A great family, indeed. It’s interesting that you said Juan and Amy were married, yet they had different last names. I didn’t address that issue because there are a number of possible explanations and, more importantly, because I don’t care what they are. The people we rode with from Tulia to Quanah for the funeral claim to have attended the wedding. Thanks, Charles. I was assuming they were married but, like I say, it wasn’t a major concern for me. I and several others were highly offended at your blog, article, or uninformed opinion. To state that you suspect they had a hard time finding clergy, sir, I am sure without a doubt that ALL the ministers of the various churches in town volunteered to speak. They consider it an honor and a favor to the family to do so. Why comment on the racial make-up of the service? Is that important? You also stated that you doubt very much anyone made a concentrated effort at racial conciliation in Quanah. Was the church segregated? Did only one race attend the funeral? Where did that thought emerge from? Did you look at the grave with the confederate flag on it, the one you made disparaging remarks about? There are many very, very old graves in this area and that could have been representing something about that person’s past. Lastly, Juan wasn’t a truck driver. He worked at the paint and body shop here in town that works on semi-trucks. I normally have a docile demeanor but I read this and was outraged. Please, be so kind as to get your facts straight before you drive three and a half hours to judge a community and people you obviously know nothing about. I on the whole I liked your piece. I don’t like the way you kept repeating about the drinking part. I know for a fact there are a lot of people who don’t drink. You make it seem like that is all we do, and use any excuse to drink. We don’t. Mr. Bean: Thank you for taking the time to attend the celebration of life for our neighbor and friends , the Rios family. Importantly the excellent description of the events of that sad day. However I take small issue of a couple of your comments. I think we as a community vote as often and as well as anybody. Yes, there are few beers consumed in the county, but, we have very few alcoholics. The Confederate flag you referred to has nothing to do with hate, This family were simply honoring their ancestor who fought for his country. He may not of had any choice. The flag you observed was the Confederate battle flag, the official CSA flag is much different. An honest mistake a lot of people make. Do the research! Memorial day is set to honor all American veterans that gave their life for their country. As President of the Goodlett Cemetery Assn. we would never allow any decoration that would represent hate or discrimination. Thank you for writing, Mr. Brandon. I think we can agree that the important issue here is the honoring of those who died so tragically. The Confederate flag issue is important, however. A large number of African Americans attended the internment ceremony, and I can assure you they do not see the Confederate flag as a benign symbol of tradition or a historical reference to the fact that their loved one died fighting in the Civil War. Personally, I am always shocked by the public display of the stars and bars. It is about heritage, to be sure, but it is not a part of our heritage that we should be proud of. Thank you, sir, for sharing your feelings with me. Thanks for the clarification about Juan’s profession; the presence of the so many truckers and the fact that several pictures of trucks appeared in the video at the funeral gave me the impression that he too was a driver. I was very moved, nonetheless, that the truckers who knew him organized such a fitting memorial. My point is that our football games and funerals are much more integrated (and not just racially) than our Sunday morning worship services. I should also respond to those who feel I was associating the community of Quanah with excessive drinking. My comments were inspired by a song lyric that I never thought I would hear in a Baptist sanctuary. It shocked me a bit, at first, but upon reflection I thought itspoke for a significant segment of the community including many of the truckers and the folks in the Cowboy regalia. Quanah’s prominent citizens and its professional people may not fit the description I offered, and perhaps I should have acknowledged as much; but my intention was to honor the kind of people who selected the music for the funeral, drove their trucks in the funeral procession, and wore Cowboy jerseys in honor of Terry Rios. My description didn’t fit all these folks, but I bet it works as a legitimate generalization. Racial issues don’t matter to white folks because we are the color of normal–at least for the time being. But every year our black and Latino brothers and sisters play a more central role in the lives of our communities and I think that’s something to celebrate. Voting rates among the Latino population continue to rise, and that too is a good thing; but a lot of people don’t vote because they don’t think it makes any difference. I was merely acknowledging that fact. Mr. Brandon, it does not matter that the flag is a confederate battle flag. It is wrong to place that flag anywhere. If the deceased person fought in the Civil War as a confederate, it is still wrong. My mother’s family is originally from the south, so I am certain that at least one ancestor fought for the south. If I discovered an ancestor’s grave, I would visit. I would even leave an American flag. If there was a confederate flag, I would remove it. Our country is united. That ancestor was proven by history that slavery is wrong. The confederacy lost for a reason. The flag represents fighting to keep slavery alive. As the president of Goodlett Cemetery Association, you should realize that it is improper to allow the confederate battle flag on a grave. If the relatives want to honor their ancestor, place an American Flag! If there was a former nazi soldier buried there, would you allow the family to place a nazi flag on the grave during veteran’s day? This is just as offensive.